From left are DeWayne and Yvonne Morgan; Ronald Strickland; the mother of a former student accepting an award on behalf of Heritage Middle School; Jonathan Connell; Alexis Quarles and Seth Cline; Charity Gibson; Jason Shattuck; James Scott Thompson and Susan Tankersley. On Saturday, Nov. 3, dozens of elected officials and local citizens gathered at The Colonnade in Ringgold to honor the contributions veterans and others in Catoosa and Walker counties have made to improving their communities and the world. The "Tribute to America" event, conducted by the Catoosa Citizens' and Veterans' Memorial, opened with an invocation by Walker County Sheriff Steve Wilson, then a posting of the colors by the Catoosa County Sheriff's Color Guard. Ella Snider sang "The Star-Spangled Banner" and Fort Oglethorpe Mayor Earl Gray led the audience in the "Pledge of Allegiance." Yvonne Morgan and Susan Tankersley, co-chairs of the Memorial, presided over the event that awarded special plaques to eight honorees in four categories after recognizing Sen. Jeff Mullis, who was in attendance, as well as the Vietnam Veterans of America Chapter 203, American Legion Post 214, American Legion Post 40, VFW Post 3679, Rolling Thunder TN II, and the Ringgold Flag Committee, which placed nearly 1,700 flags around Ringgold for Veteran's Day. This was the fifteenth year the Catoosa Memorial Committee has presented awards. A special printed tribute was provided honoring United States Army veteran Richard Allen Simpson, who died in April of this year. In addition to elected officials who participated in the event, Catoosa County Probate Judge Jeff Hullender and Fort Oglethorpe Councilwoman Rhonda James were in attendance. The event closed with a benediction by Catoosa County Sheriff Gary Sisk. The Catoosa Citizens' and Veterans' Memorial is maintained by an all-volunteer board. The board and other volunteers will be replacing the flags representing all branches of the United States military the second week of October. Susan Tankersley and Yvonne Morgan, co-chairs of the Memorial board, say people are invited to visit the Memorial at the entrance of Benton Place Campus in Ringgold to reflect on the sacrifices and service of those who work to keep America safe and secure. Walker County School Board members (from left) Bobby McNabb, Phyllis Hunter, Karen Stoker, Dale Wilson, and Mike Carruth stand with Superintendent Damon Raines following a recent school board meeting. 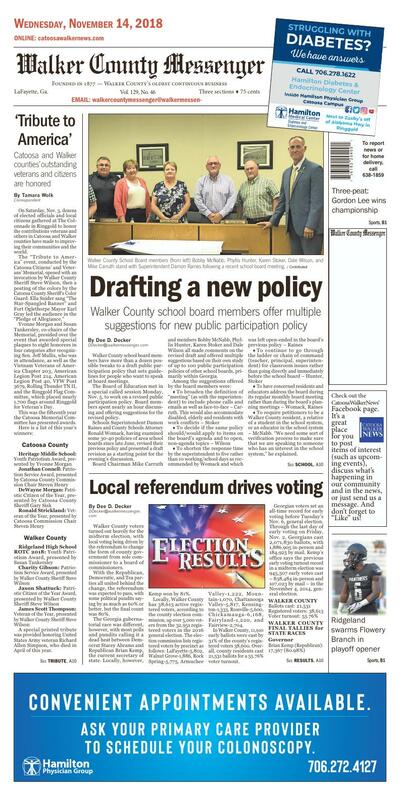 Walker County school board members have more than a dozen possible tweaks to a draft public participation policy that sets guidelines for people who want to speak at board meetings. The Board of Education met in a special called session Monday, Nov. 5, to work on a revised public participation policy. Board members spent nearly an hour discussing and offering suggestions for the revised policy. Schools Superintendent Damon Raines and County Schools Attorney Ronald Womack, having examined some 30-40 policies of area school boards since late June, revised their previous policy and presented a draft revision as a starting point for the evening's discussion. Board Chairman Mike Carruth and members Bobby McNabb, Phyllis Hunter, Karen Stoker and Dale Wilson all made comments on the revised draft and offered multiple suggestions based on their own study of up to 100 public participation policies of other school boards, primarily within Georgia. • To require petitioners to be a Walker County resident, a relative of a student in the school system, or an educator in the school system – McNabb. "We need some sort of verification process to make sure that we are speaking to someone who has an interest in the school system," he explained. • To allow petitioners to register or sign in the day of the board's meeting and be allowed to address the board that evening – Stoker. "We need to have something in there that will allow our public to know that they are welcome," she said. Suggested variations of this open registration could be within 24 or 48 hours of the meeting at which the petitioner desired to speak. Whenever a finalized revised policy is agreed on and adopted by the board, there is still a 30-day review period before it officially would go into effect. Stoker suggested that perhaps a temporary policy could be adopted until a permanent one goes into effect. "Until we get a policy in place, there needs to be some open avenue of public participation," she said. With the 2015 "freedom of speech" lawsuit challenging the board's previous policy and the recent desire of some Fairyland Elementary School parents to address the board, the irony is that in the 40 years the board has had a public participation policy, established in 1978, that petitioners have addressed the entire school board at one of its meetings only five times. "The public participation policy has been used five times since it was adopted by the board. That does not mean these were the only opportunities for the public to address the full board during that timeframe. The public has access to our board members in a variety of other avenues, including email, telephone, and individual meetings or meetings with two members. The board has also had a large number of special meetings (town hall meetings) that deal with issues that arise that stimulate high interest such as the timely completion and opening of a new school, the possibility of rezoning, the discussion of our choice to become a Strategic Waivers School System (SWSS), and the required budget hearings that happen each year around the adoption of our annual budget; all of which have happened during my tenure as superintendent. I cannot speak to what happened prior to my time here in Walker County; although I have heard stories of this same type of meeting/meetings that have happened in the past where the public was invited and had the opportunity to address the full board during a scheduled meeting." Jim Barrett, a Walker County teacher and president of the Walker County Association of Educators, listened to all the suggestions, recommendations and discussion by board members but was dissatisfied with what he heard, calling their proposals and concerns a "disaster." He said after the Nov. 5 meeting that any new policy along the lines discussed in the meeting would be challenged, primarily because the board is trying to draft a policy "without the public's input." When asked about Barrett's charge that the board is trying to draft its new policy "without the public's input," Raines cited the 2010 Georgia Code, Title 20 – education, Chapter 2 elementary and secondary education, Article 3 local boards of education, Section 20-2-61 Fundamental roles of local boards of education and local school superintendents, which he said "is clear about the Board's responsibility to establish policy. There is no mention of public input and it also states very clearly in (b) '...no local board of education shall delegate or attempt to delegate its policy-making functions.' If the Board used public comment to establish, that would at least be an attempt to delegation its policy-making function to the public," Raines explained. That code also states in (a) that "The fundamental role of a local board of education shall be to establish policy for the local school system with the focus on student achievement. The fundamental role of a local school superintendent shall be to implement the policy established by the local board." Jim Barrett, a teacher at Saddle Ridge Middle School and president of the county's Association of Educators, challenged the school board's public commenting policy in March 2015. The policy required anyone who wanted to address the board to first meet with the Damon Raines, the school superintendent. After this meeting, the person could file a request with the central office to speak to the board. The request had to be filed at least two weeks before the meeting. The policy required Raines to investigate a concern within 10 days and send a written response to the concerned person. But there was no specific deadline or timeframe for when Raines actually had to meet with the concerned person. U.S. District Court Judge Harold Murphy in Rome, Ga., ruled in April 2016 that the school system must establish a new policy that, at very least, sets a timeframe for the superintendent to meet with the concerned person. The board was also ordered to review policies from 11 North Georgia counties. The school board unsuccessfully appealed the judge's ruling, with its final appealing failing in May 2018. The school board was ordered in June 2018 to settle with Barrett (for an undisclosed amount) and to pay Barrett's attorneys $330,000, all which comes from an insurance company. Walker County voters turned out heavily for the midterm election, with local voting being driven by the referendum to change the form of county government from sole commissioner to a board of commissioners. With the Republican, Democratic, and Tea parties all united behind the change, the referendum was expected to pass, with some political pundits saying by as much as 60% or better, but the final count was 80%. The Georgia gubernatorial race was different, however, with most polls and pundits calling it a dead heat between Democrat Stacey Abrams and Republican Brian Kemp, the current secretary of state. Locally, however, Kemp won by 81%. Valley-1,222, Mountain-1,070, Chattanooga Valley-5,817, Kensington-1,333, Rossville-5,600, Chickamauga-6,168, Fairyland-1,220, and Fairview-2,704. In Walker County, 11,910 early ballots were cast by 31% of the county's registered voters 38,600. Overall, county residents cast 21,531 ballots for a 55.76% voter turnout. Georgian voters set an all-time record for early voting before Tuesday's Nov. 6, general election. Through the last day of early voting on Friday, Nov. 2, Georgians cast 2,071,830 ballots, with 1,886,905 in-person and 184,925 by mail. Kemp's office says the previous early voting turnout record in a midterm election was 945,507 early votes cast – 838,484 in-person and 107,023 by mail – in the November 4, 2014, general election.